Club Penguin Cheats by Mimo777 Club Penguin Cheats by Mimo777: Club Penguin New Spooktacular News! 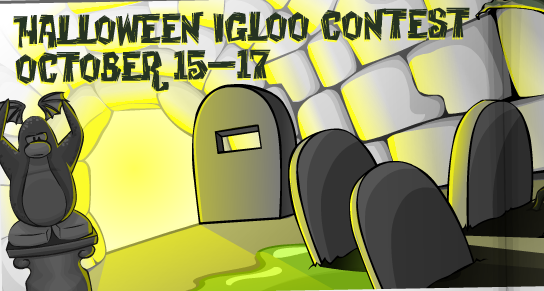 Igloo Decorating Contest will be here soon to help celebrate Halloween. The good news is there will be a new Better Igloos Catalog on October 15th just in time to submit your decorated iggy from October 15th-17th. But, make sure you don't make any changes to your igloo after you submit it. You will need to give the judges time to get to your loo and check it out! Remember, they are looking for creativity, not just lots-o-stuff! Don't worry, though, there will be more details about it next week! 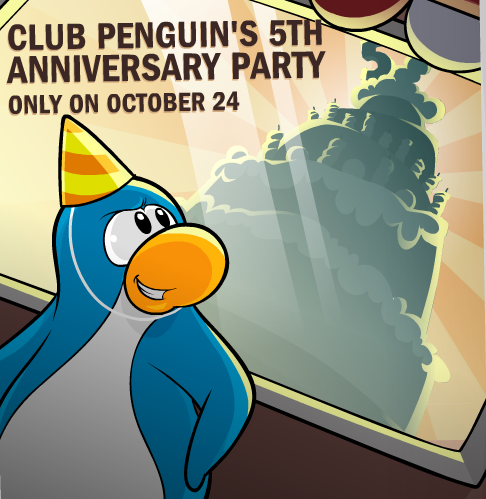 Club Penguin's 5th Anniversary Party will be here on October 24th in the Town Center! This ONE DAY ONLY party will be sure to be a blast! Every penguin who attends will receive a party hat! These hats are one of the best items on Club Penguin you can collect because it will never be repeated! But, wait, that's not all! There will also be a new Yearbook in the Book Room and, of course, cake! The big question this time of year around the island is, "Will there be an storm for Halloween?" Well, Gary the Gadget Guy has been checking, but no sign of a storm... yet! We need to keep a watch out for one, because there could be one on the horizon! 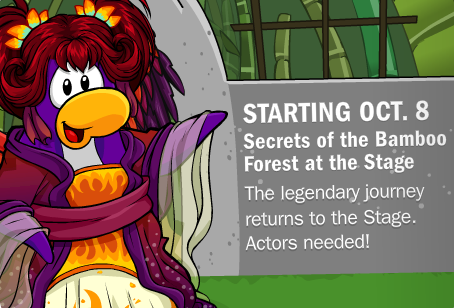 The Secrets of the Bamboo Forest will be returning to the Stage later today. Along with new postcards an pin. Be sure to check back here for all the cheats! So much coolness coming soon, don't ya think? Let me know what you are the most excited about! Have you played Cargo Bridge? im most excited for the Halloween party! I cant wait!! and the annivasary party! Yay! i was really worried that there wouldnt be a new better iggies! but there is! storm?? like the last 2 years? do you think it might shoot the dojo or something to make the water dojo appear???? ?